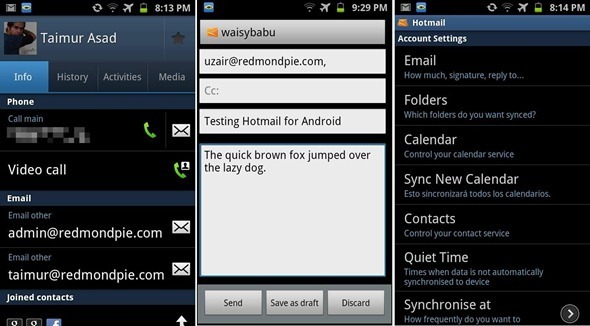 Microsoft recently released a dedicated Hotmail app for Android which we we will be talking about today. Android, being an OS from Google provides the best experience for folks who use Google services like Gmail, Maps, Docs etc. but doesn’t for people who like using, say, Microsoft’s Hotmail service or Apple’s MobileMe service (now replaced by iCloud). If you want the best experience of Microsoft’s services, you get should get a Windows Phone. Similarly, fans of Apple’s services should get an iPhone. This app is for those of you who own an Android smartphone, but still use Windows Live Hotmail. Hotmail for Android is quite a powerful app. It has push email ability so you don’t have to manually refresh to check new messages (or wait for extended periods of time), it syncs your Calendar and Contacts, allows you to send attachments such as photos, videos, documents etc. and, if you’ve got multiple accounts on Hotmail, it supports that too! As far as I know, your phone’s calendar cannot sync with your Hotmail calendar if you set it up via Settings > Accounts & Sync but it will sync with your Hotmail calendar if you use Microsoft’s Hotmail for Android app. 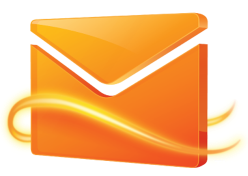 This, and its Contacts Sync may be two big reasons why Hotmail users should consider trying this app out. We’ve personally tested the app on our Samsung Galaxy S II and can confirm that it works as claimed. It isn’t as much of a looker as the built-in Gmail app or Yahoo! Mail app that was released a couple of months ago, but it works just fine. If you’re interested, the app can downloaded for free from the link embedded below. It is compatible with all Android smartphones running Android 2.1 Éclair or later.